I like creating things out of nowhere. It always makes me so glad and proud. When I first faced a smartphone app, I felt a lava of thoughts boiling inside me. I was curious about the tiny worlds caught in a rectangle screen. I wondered how people made these stuff, and I also wanted to make one myself. Now I am working on an app that lets students learn English words. A cute character would eventually grow up as the users learn the words. These are some characters I drew using an Adobe program. 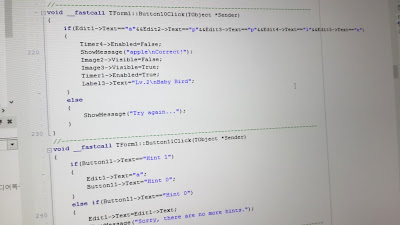 The lines of code I wrote. It was about a month ago when I learned a big lesson - you must always save your hard work. The only version of the app I made for several months was on my notebook computer, and one day my notebook computer went totally crazy. The 600 lines of code were not there when I opened the file. It was literally a tragedy. Later I found an older version of the app and recovered it. Then I was sensible enough to copy and paste the app in my USB flash drive. I am hoping to put my app on the Google Play Store soon. I love this feeling - creating something and giving it to people and seeing them be so happy with it. I really wish my app would make kids enjoy learning new words. At least they would like the characters, wouldn't they?